Screenshot via MSNBCFormer CIA director John Brennan. Trump is “unstable, inept, inexperienced, and also unethical,” Brennan said in an interview with MSNBC. Brennan said he has gone from being “angry” at Trump for his words and actions, to a state of “deep worry and concern” about what he described as a lack of leadership in the White House. His comments follow a week that saw an avalanche of troubling headlines about top Trump aides, the Russia investigation, high-profile White House departures, and a widely criticised policy announcement that prompted near-immediate global backlash. 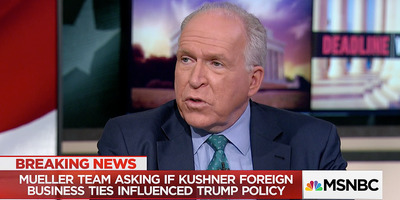 As another unprecedented week of tumult came to an end Friday, Brennan delivered a brutal assessment of Trump, calling him “unstable, inept, inexperienced, and also unethical” in an interview with MSNBC. “And I think this is now coming to roost,” Brennan said, referring to the magnitude of the chaos that seems to flow constantly from the Trump White House. He expressed concern that in the midst of it all, Trump is no more prepared to lead nearly 14 months into his presidency than he was on day one. Brennan pointed to looming threats from North Korea and Russia in particular, chastising Trump for “tweeting about Alec Baldwin” while Russian President Vladimir Putin was “flexing his muscles” on the military front. “And I do think, unfortunately, it is going to get more painful, a bit worse before it gets better,” Brennan said. On the domestic front, this week saw embattled senior White House aide and Trump’s son-in-law, Jared Kushner, headline multiple troubling stories in the span of one day, including pointed questions about whether he might be using his official government role for personal gain. Kushner also lost his top-secret security clearance this week, due to unresolved red flags in his federal background check that he has struggled to overcome. Trump’s eldest daughter, Ivanka, was not spared. She was scrutinised over an international business deal that reached a coda shortly after her father took office. The Trump administration also lost another communications director in Hope Hicks – one of Trump’s closest and most trusted aides. The apparently fraying edges of that relationship were on full display after her resignation was announced on Wednesday.Trump was said to have berated Hicks, who earlier in the week admitted to congressional lawmakers that she sometimes told lies on Trump’s behalf. The West Wing drama rolled on, with reports that national security adviser H.R. McMaster could be on his way out, and news that Trump’s chief of staff, John Kelly, is still smarting from the scandal around former staff secretary Rob Porter, who was ousted last month over allegations of domestic abuse. Former CIA director Brennan said it’s all just a bit too much: “The longer this goes on, the worse it’s going to get,” he said.